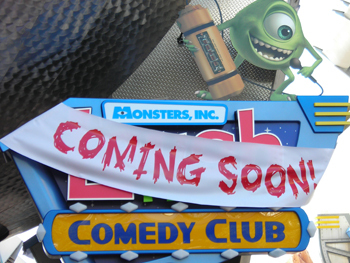 Just saw this on The Disney Blog: Laughingplace.com tells us that the Monsters Inc. Laugh Floor Comedy Club will open April 2 at Walt Disney World’s Magic Kingdom. I’m looking forward to hearing how the show’s been improved since my son and I caught a soft opening in December. Despite my geeky frustrations with the audio/visual problems, and plenty of shortcomings in the show content, I do think there’s potential here for a good, solid attraction, especially for the 7-10 crowd. They’re just a little too old for Turtle Talk with Crush, but will still be charmed by the comedians interacting with the crowd, and (if this survives) thrilled to see their own jokes told on-stage, after text-messaging them to the cast and crew. They might really miss Sully, though . . . my understanding is that his fur is too expensive and difficult to render on-the-fly, so he won’t be appearing in the attraction anytime soon. For what it’s worth, my son and I still rattle off lines from the attraction from time to time, and we only saw it just that once. You know who my son wants to be for Halloween this year? That guy! This just in from Mr Broke Hoedown . . . Round 4 of the Maverick Stand Up Jungle Cruise Skipper night will be held March 18, in Fullerton California. We caught the story on BoingBoing, and full details are available at Maverick Standup. Of course I’m immediately tempted to book a quick trip to Fullerton. If it were baseball season I might just give in, as long as the Fullerton Flyers had a home game that weekend.